35mm, black and white, 92 mins. A young woman heads for a Scottish island where she plans to marry an old industrialist for his money. But bad weather prevents her reaching him, and she finds herself falling under the spell of the local laird. After the relative failure of A Canterbury Tale (1944), Michael Powell and Emeric Pressburger allowed themselves, for the first time since 1940, a break from propaganda filmmaking. The war is a distant backdrop to "I Know Where I'm Going!" (1945), an unconventional romance set in the Western Isles. It was perhaps the pair's most personal film to date: a metaphysical love story which confirmed their continuing departure from Britain's realist tradition. IKWIG (as the Archers themselves referred to it) is a full-blown critique of materialism - in the philosophical as well as the economic sense - continuing themes identified in A Canterbury Tale , to which it is, in many ways, a companion piece. In both films, a city girl is transplanted into a rural environment and comes to question her preconceptions. But whereas Alison in A Canterbury Tale is already sensitive to the spirituality of rural England, Joan, the single-minded young heroine of IKWIG , takes some time to wake up to the essentially self-denying effect of her material ambitions. Alison is a willing traveller on the path to self-discovery; Joan resists until the elements - and her long-suppressed feelings - have drained the fight from her. Joan is a complex character, whose desperation to fulfill her goal - marriage to a wealthy industrialist - ends up risking not only her future happiness, but the lives of herself and others. So strong is Wendy Hiller 's performance that although Joan is sometimes insufferable, we warm to her as she gropes towards self-knowledge. Like Alison, Joan is guided on her spiritual journey by a mysterious stranger. 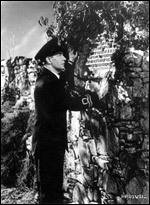 Torquil ( Roger Livesey ), the absentee Laird of Killoran, is, however, a more straightforward and less sinister figure than Canterbury 's glue-man. He is a gentle and patient man, easy in his environment, with a calm wisdom which is the mirror of Joan's recklessness. For Powell, "I Know Where I'm Going!" meant a third visit to the Scottish islands, scene of his breakthrough films Edge of the World (1937) and Spy in Black (1941). The film once again demonstrated Powell 's unusual sensitivity and respect for the lives and ways of remote island communities, and his spiritual feel for landscape. The film's strange atmosphere - the plot abounds with superstition, folklore and curses - confused audiences at the time. Today, though, IKWIG is one of the duo's best-loved films, cherished for its heightened romanticism and fine performances, and for Erwin Hillier 's ravisihing cinematography. *This film is the subject of a BFI Film Classics book by Pam Cook.